The BFA Self Assessment Presentation from July 15, 2016, is available for download as a PDF here. What can we do with financial aid data? During the 2016 CCG Forum in October, many participants raised concerns about using financial aid data for purposes outside of the financial aid office. The National Association of Student Financial Aid Administrators released a report on financial aid data sharing that addresses many concerns that factuly, student affairs and academic affairs staff and administrators raised. The report is available for download below. The Georgia College Care Resource Page is designed to provide resources for students to assist them with college completion. It is important to focus efforts on providing higher education for students in need because attaining a post-secondary credential has become increasingly important for securing opportunities to get high-return jobs in the U.S. in the 21st century. According to Carnevale, Smith, and Strohl (2010), over half of the jobs in the United States will require a post-secondary credential in the future. 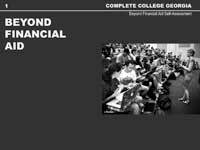 Beyond Financial Aid is a project of the Lumina Foundation.